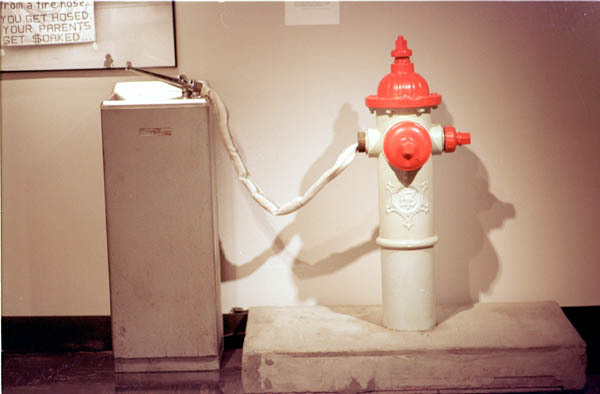 HOSED -- The MIT Museum's special exhibit on hacking has been extended through the end of the month. The exhibit features pieces and pictures of famous hacks. 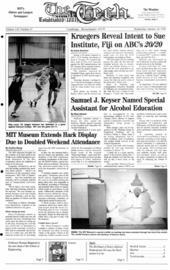 The MIT Museum brought out the contents of its hack archives last Friday in an exhibit designed to promote awareness in the MIT Community about the exhibition of hacks at the museum. Originally scheduled to run for only the holiday weekend, this auxiliary hacks exhibit which is an extension of the museum's more permanent "MIT Hall of Hacks"exhibit has been extended, and all hacks will be on display until the end of Independent Activities Period. "We've had a very busy weekend,"said Jane Pickering, director of the museum. "We were actually surprised, because we're not usually opened on Mondays, and we doubled our number of visitors over the weekend." According to Gallery Attendant Cate Mackinnon, response to the exhibition has been very good. Since Pickering's tenure as museum director began last year, the museum has been considering how much space the hacks are taking up. In the past, Pickering has said that she would like to deemphasize hacks at the museum, to look at MIT and its community and its history in a wider way, and that the museum would like to encourage input from the MIT community on this issue. In that vein, the museum held a special dinner last Saturday with members of the MIT community including coordinators of the museum, the IHTFP Gallery, current students, and recent alumni. Discussion was centered around what to do with the museum's collection of hacks. "I certainly learned a lot, which was great," Pickering said of the dinner session. Suggestions from the session included putting the hacks where they were originally (a bit difficult, according to Pickering) and potential other areas of campus which might be good places to put hacks. Additionally, members of the dinner session started the discussions to determine guidelines for the museum collections committee on which hacks should be preserved. "I think people tend to have comments about how much affection people hold the hacks in," Pickering said. It was "certainly never my intention not to display any hacks. People do think that they really have a big part to play with the museum." The "Hack Flashback" exhibit contains a number of hacks which the museum describes as being "many of the greats." Hacks in the temporary exhibit include several which are the namesakes of Athena dialup servers, such as buzzword-bingo (some of the original "Buzzword Bingo" cards used during Vice President Al Gore's graduation speech in 1996), cathedral-seven (the 0 x 10 commandments and one of the mock stained-glass windows from the Church of Our Lady of the All Night Tool hack in 1992), biohazard-cafe (menus from the mock-cafe in 1995), and scrubbing-bubbles (one of the cartoon logo creatures placed on the Media Lab in 1995). The exhibit also includes artifacts from lesser-known hacks. The exhibit, for instance, contains the original "U.S.S. Tetazoo" ship model, which hackers added to the museum's Hart Nautical Gallery in 1979. Other hacks in the exhibit include a menorah which was placed atop the small dome in 1993, a swing which was placed in Lobby 7 in 1991, and various documents by a mock-fraternity called Gamma Alpha Gamma during Residence/Orientation week in 1991. According to Pickering, most of the archived hacks are now on display, although there are still tapes and other videos which haven't been put up. The exhibition does contain a video with news clips from local television stations who reported on the campus police car on the dome hack in 1994, including one clip with an interview with a student named "Jack Florey." "The general public has the most questions about the exhibit because it's very inside," Mackinnon said. Nonetheless, even non-MIT visitors to the museum seemed to enjoy the hacks exhibit. "Some of them I don't get," admitted Danny Eller, who is unaffiliated with MIT. He seemed to enjoy the hacks, however. "I really like"the hacks, said Bob Sumner G. "I think it's really great that these are preserved� I like the school's attitude [about hacks]. It's a really important part of the school's culture," Sumner said. Ryan Smith '93 came to the museum to see the newly-displayed hacks. "I like the Hall of Hacks,"he said, but "I realize that the space is an issue. I think it would be cool to see the hacks rotated."